John Seed interviews painter Anne Harris on the occasion of her exhibition of new paintings at Alexandre Gallery, New York, on view from April 6 through May 11, 2013. Seed writes: "The gradual evanescence of Harris's imagery is occurring as a feature of what she acknowledges is a 'long standing evolution.' She confides that 'over the years I have become more and more interested in the the idea that I am painting a slice of air.'... Emotionally, technically and stylistically Harris is walking a tightrope, and she seems genuinely thrilled to be there. Describing one of the 'invisibles' to me on the phone, she tells me that, 'the figure might have less weight than the air: I love trying to paint dense air. 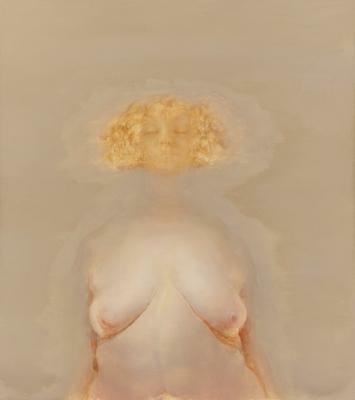 The entire painting becomes the body. It is exciting to me that everything is skin and air.'"